Fifty years ago, less than a month after the 1963 March on Washington, a bomb exploded at the 16th Street Baptist Church in Birmingham, AL, killing four young African-American girls. The bombing, perpetrated by a white supremacist, became a defining moment of the Civil Rights Movement and sparked the outrage that led to the 1964 Civil Rights Act and the Voting Rights Act of 1965. Martin Luther King, Jr., called the attack “one of the most vicious and tragic crimes ever perpetrated against humanity,” and public opinion began to turn against segregation. 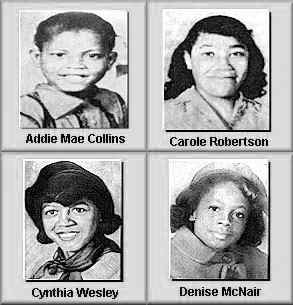 The IAM salutes the memories of Addie Mae Collins, 14; Denise McNair, 11; Carole Robertson, 14; and Cynthia Wesley, 14. At a ceremony marking the 50th anniversary of the bombing, the bell at the 16th Street Baptist Church rang four times to commemorate the victims. This week, the four girls were posthumously awarded the Congressional Gold Medal, one of the country’s highest civilian honors. “It galvanized Americans all across the country to stand up for equality and broadened support for a movement that would eventually lead to the passage of the Civil Rights Act of 1964,” said President Obama. Click here to learn more about the 1963 Birmingham Church Bombing.